What is The Scene? Well, if you are in your 20s and 30s, you like the theatre, you like networking, you like engaging with your community in a meaningful way and you care about the future of the arts on Hennepin Avenue, then the answer is: You. 1. Exclusive Ticket Offers: The Scene members are privy to exclusive ticket offers to Broadway shows, concerts and other events. 2. Special Events: We the people, of our 20s and 30s, dig parties, right? We’ve got the party thing covered. 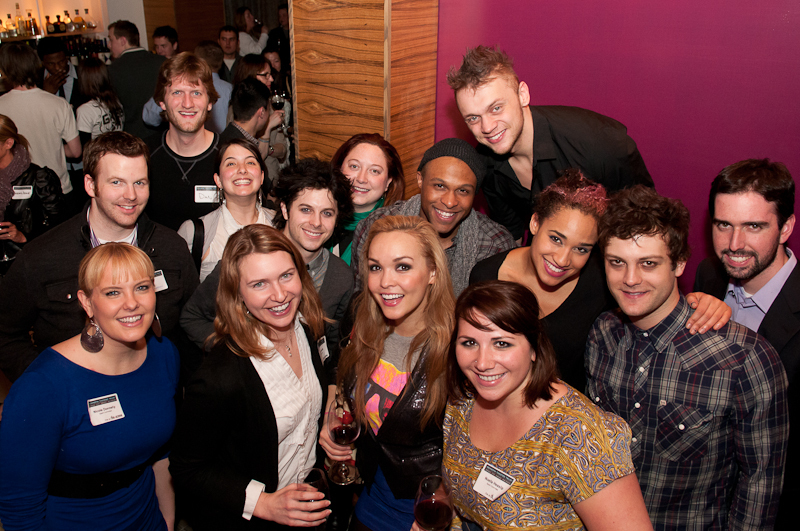 The Scene members are often invited to opening night parties to grab a drink, nibble on some food and snap photos with the cast- like the one above with American Idiot. We also have smaller meet-and-greets or Q&A’s with cast members if that’s more your style- like this one with Million Dollar Quartet. 3. Broadway Confidential: Members of The Scene receive complimentary access to all Broadway Confidential events. These happen Monday nights before each Broadway show and feature a speaker who is an expert on a topic relating to the show. 4. Drink Discounts: Back to that whole “deals” thing. You show ‘em your Scene card—you get $1 off drinks at the State, Orpheum, Pantatges and New Century Theatres. Done and done. 5. Networking: Members of The Scene include executives to teachers to entrepreneurs to artists. Connect to us and we’ll connect you to each other. 6. It’s your Plan-It Hennepin: The future of Hennepin Avenue is in your hands. As Hennepin Theatre Trust works with Walker Art Center, Artspace and the City of Minneapolis to improve Hennepin Avenue, we want The Scene members to be a part of these discussions. Check out our page to learn more. Or just join The Scene and we’ll let you know all the ways you can be involved. 7. Give in to your philanthropic self: Angelina and Brad made philanthropy cool—but we know better—they make it cool because they look great doing it together. By becoming a part of The Scene you are not only getting access to tickets, events and networking with like-minded people, you’re also getting connected with Minnesota’s seventh largest non-profit organization. And we hope the more time you spend with us, the more time you’ll want to spend with us. Our educational and community engagement programs such as Access, Critical View and our nationally recognized SpotLight Musical Theatre Program are doing some serious good. And I have a feeling you might look great doing some serious good with us. Enjoy a pre-show cocktail hour with The Scene before attending the evening's performance of Disney's Beauty & the Beast at the Orpheum Theatre. Price includes one drink ticket and appetizers at the 6-7:15pm cocktail hour and a ticket to the show in section C seating (normally $74).